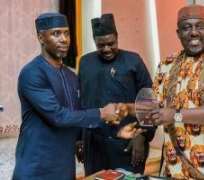 The son-in-law of Governor Rochas Okorocha, Mr. Uche Nwosu, who lost in the bid to fly the flag of All Progressives Congress in the coming elections, has led other aides of the governor and APC members of the State House of Assembly to the Democratic People's Party (DPP), where he will seek to actualise his ambition.. Governor Okoroacha himself announced the movement yesterday in Owerri, when he spoke with journalists at the Government House. “I have been trying to manage the situation but I have no moral justification to stop the aggrieved candidates who felt short-changed from realizing their ambitions in any other party but I have not left APC and do not intend to leave APC. But you must realize that in Imo we don't play party politics but politics of individuals. People did not join APC because of anybody but because of me,” he said. He however said that he would work towards re-election of President Muhammadu Buhari.